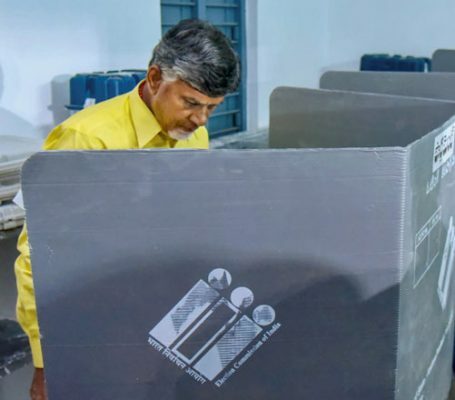 TDP President and Andhra Pradesh Chief Minister N Chandrababu Naidu casts his vote during the first phase of the general elections, in Amaravati, Thursday, April 11, 2019. Anantapuram: Andhra Pradesh Chief Minister N Chandrababu Naidu has written a letter to the Election Commission of India (ECI), requesting an extension of polling time in the State to compensate for the time lost due to reported technical glitches in EVMs in several polling booths. Naidu wrote in his letter: “A number of complaints are being received from the contesting candidates, chief election agents and the media that in several cases EVMs did not function to start the polling at 7 am. As a result commencement of polling got delayed between half an hour to one hour. However, polling has commenced in those stations after repair/replacement of EVMs. In all these cases it is necessary that polling time is extended to compensate the time lost in repairing/replacing the EVMs.” Polling at Kanchikacherla village of Krishna district had to be halted till the machines were rectified or replaced. Voting was delayed at booth numbers 196, 198 and 200 of the region. A similar situation was witnessed at booth numbers 141 and 142 of the Ummalada village of Visakhapatnam district.